Cryptopay FAQ: how to buy bitcoins? what is crypto card? etc - How to find my ETH address? All Categories › Buy, deposit, withdraw › How to find my ETH address? Once you add your ETH account, you can buy, send and exchange your ethers straightaway. But if you wish to deposit ETH from an external wallet, you will need an ETH address to proceed. Here's a quick guide how to create an address for your ETH account. Log into your Cryptopay account, in the Accounts tab choose your Ethereum account and click on it. Done! Now you have an ETH address. 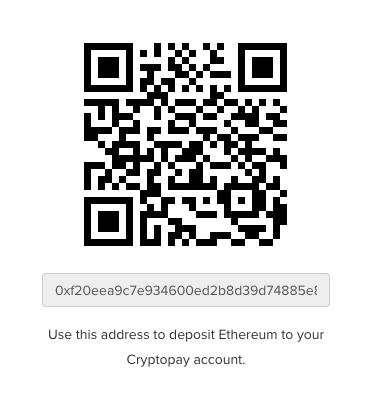 You can copy it or scan the QR code in order to deposit some ETH.